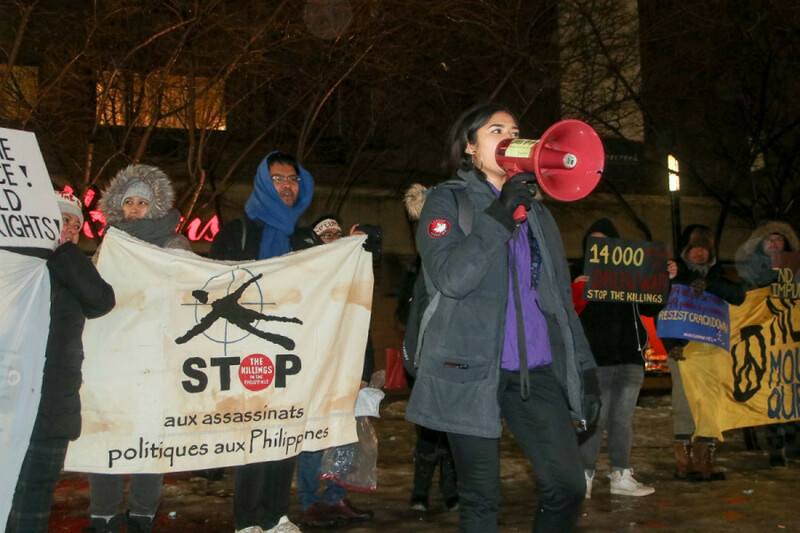 More than a dozen activists gathered in downtown Montreal to denounce the fascist rule of Filipino President Rodrigo Duterte Friday. Duterte’s war on drugs has led to the death of thousands of people in the Philippines, beginning after he took office in June 2016. It’s revolved around the killing of civilians suspected of drug use or selling drugs, killing a total of 20,000 since Duterte took office, according to Antonio Trillanes, an opposition senator to the Philippines Senate. 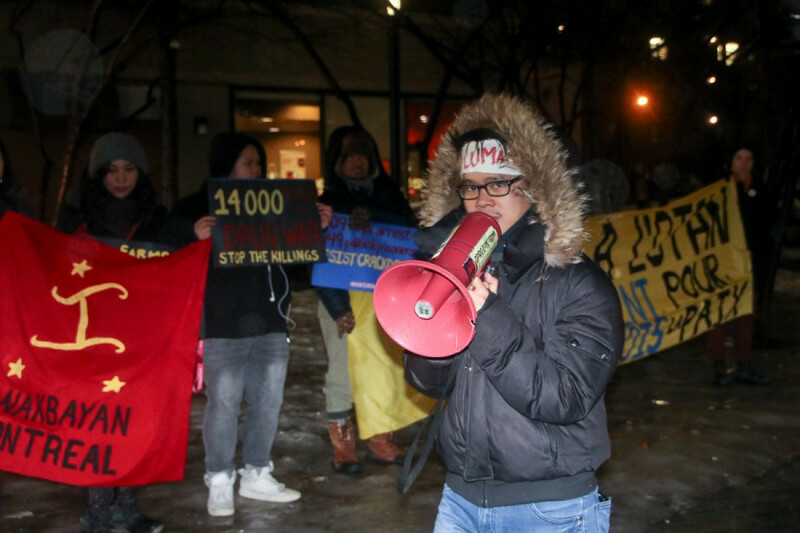 The gathering took place at Norman Bethune Square by Concordia’s downtown campus, and was organized by Anakbayan Montreal—a Filipino-youth organization focused on “fighting for national democracy”— and the Centre for Philippine Concerns. On the same day, many students in the Philippines staged a walkout in protest the Filipino government. Participants also commemorated the 32nd anniversary of Filipino people ending decades of rule under fascist president Ferdinand Marcos in a non-violent revolution, described as “the people power uprising” by Marie Boti, involved with the Centre for Philippine Concerns, while speaking on behalf of the International Women’s Alliance. “The Philippine peoples and revolutionary movement is one of the most powerful and inspiring in the world,” Boti added. “They are organizing against tyranny today—they are risking their lives today,” Boti announced aloud, while stating we must stand with them and support their struggle. 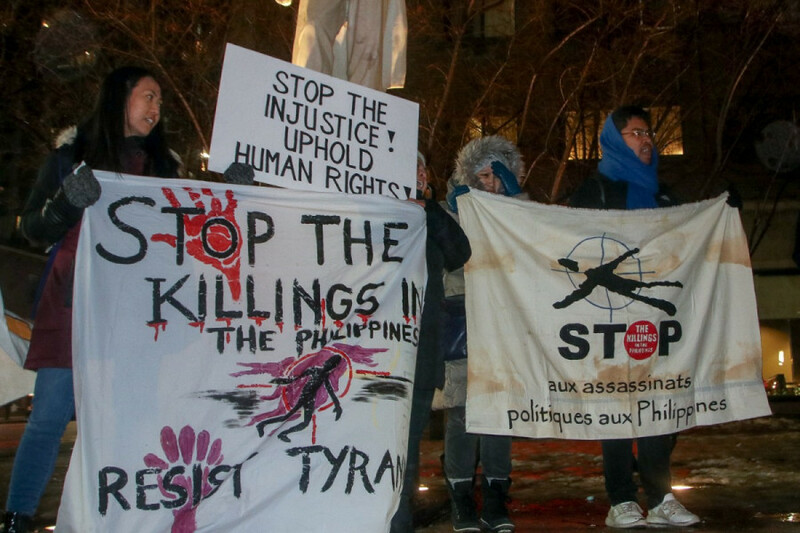 The human rights situation in the Philippines has become grim since Duterte’s debut as president in 2016, said Beatrice Dimaculangan, a McGill student who’s part of the human rights committee at Anakbayan Montreal. “Various human rights organizations and the United Nations have attributed the drug-related killings to the Philippines National Police under the anti-drug campaign,” Dimaculangan said. Boti added that Duterte is not addressing the root of the problems that poor communities are facing, which includes joblessness and homelessness. Dimaculangan reminded onlookers that Duterte’s rule does not only impact civilians suspected of selling or using drugs. “Assassinations of Indigenous leaders, national minorities, human rights, and anti-mining activists by military death squads are now a common occurrence,” she said. “We’re connecting the drug problem with the problems of poverty, meaning to say that if there were more education, more jobs, than people [would] have less likelihood to go to use drugs,” said Elesser Bulatao, the secretary general for Anakbayan Montreal. Bulatao said he encourages those to become involved in attending future picket lines for Anakbayan Montreal’s campaign “Stop the Killings” in support of people in the Philippines.